Kids who attend a Darwin childcare centre and people they are close to are being given antibiotics, after a death from meningococcal disease was confirmed. 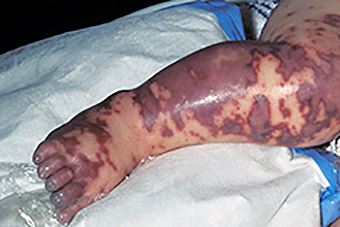 Authorities at the NT Department of Health have said it is unlikely the current case, from a child that attended the Malak Family Centre, is linked to an outbreak of meningococcal in Central Australia, but tests are underway to check. "We are still waiting for some final lab results," said acting director of the NT Centre for Disease Control, Dr Charles Douglas. So far there have been 27 cases of the W strain of the contagious disease in remote parts of the Northern Territory, with cases also confirmed in the APY lands near the South Australian border, and in remote parts of Western Australia. Typically there are fewer than four cases each year. Dr Douglas said clearance antibiotics were being given to prevent those who had been in close contact with the child. "There are two reasons [for the antibiotics]. One is to make sure nobody becomes unwell and secondly, to see if the person or people who are carrying it in their throat, they can get rid of it," he said. The childcare centre in Malak has remained open. What you need to know about the W strain of meningococcal. Symptoms of the disease include fever, headache, neck stiffness, an aversion to bright lights, a rash and joint pain," the Department of Health said. "Those affected may also have vomiting and diarrhoea, be difficult to wake up and babies may refuse food and drink and have a high-pitched cry." The infection can progress very quickly but can be treated with antibiotics. The W strain of the disease is not covered under the general free vaccination schedule in the NT, but the Centre for Disease Control plans to introduce it next year. There is a roll-out of vaccinations of the W strain though in some remote communities. "We are rolling that out in Central Australia, Katherine, Barkly and Katherine West for people aged 12 to 19 in the remote communities and Aboriginal people in Katherine, Tennant Creek and Alice Springs," Dr Douglas said. He said parents in other areas should talk with their GP to decide whether children should be vaccinated for all strains of the disease. "We are advising parents who are worried — and it is understandable why they would be worried — to discuss it with their GPs and if they decide to have the vaccine, it is available on prescription from a pharmacy," he said. Dr Douglas refused to say when the child who died last attended the childcare centre in Malak.